OSWEGO – Don’t complain about our winter snow, paint it! The perfect way is at a Paint Party by Riverside Artisans on January 9. 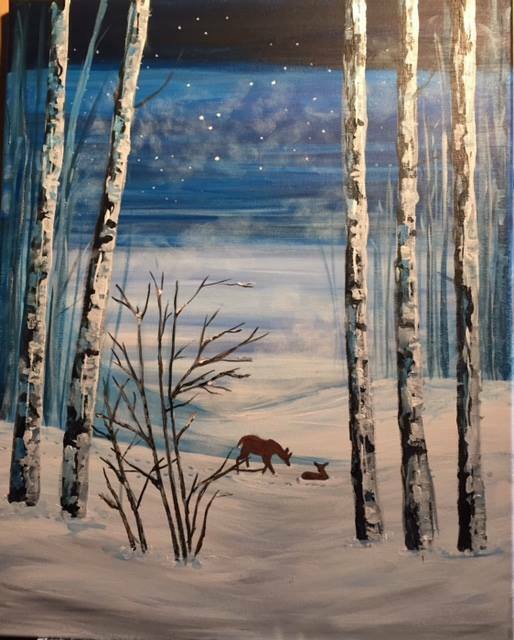 Participants at the party will paint Bonnie Sommers’ delightful winter scene Evening Mist. She is well-known in the area for her lifelike and exquisitely detailed wildlife and bird paintings. The first Paint Party of 2017 will take place January 9 at Oswego’s Canal Commons Community Room. Riverside Artisans is the new name of Oswego’s art and gift shop, featuring the works of local artists and craftspeople in their unique shop in the heart of downtown Oswego. The event will take place from 7 to 9:30 p.m. Plenty of spaces are available for this event, the latest in the series of highly popular paint parties presented by Riverside Artisans. The cost of the event is $45. All materials: brushes, paints, canvases, aprons and easels will be provided. Participants need only to bring their own refreshments. $10 is due at the time of the reservation, and the remaining $35 is due the night of the event. Gift certificates for Paint Parties are now available at the Riverside Artisans. Give a certificate and the recipient can register for any of our upcoming paint parties. Reservations and gift certificates are available in the Riverside Artisan’s Canal Commons shop at 191 W. First St. The Riverside Artisans store is open Monday – Saturday from 10 a.m. to 6 a.m. and Sunday from noon to 4 p.m.